Before moving to a 20-acre lot in 2006, Johnson’s Backyard Garden (JBG) was literally just a garden for, well, the Johnsons, Beth and Brenton in Austin, TX. 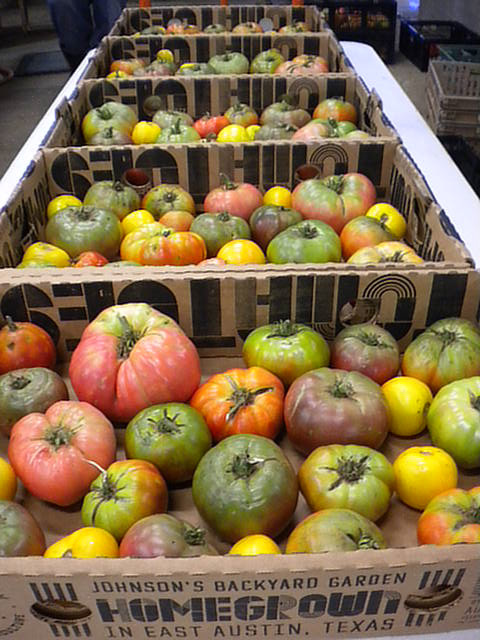 Today JBG is a 70-acre certified organic farm that functions through a Community Supported Agriculture (CSA) program, meaning that members buy a “share” in JBG’s crop and in return they get delicious boxes every week of whatever the hard-working people have harvested. JBG counts with over 1,000 members making it the biggest CSA farm in Texas. Earlier this year, JBG started using a new logo created by fellow Austinite Ryan Rhodes who happened to end up living in the Johnsons’ old house. There’s no deep philosophy behind it really. There’s just that gut feeling you get when you see something and it just feels right. Hard to put in words I think without sounding really silly. When I started exploring designs for JBG, I had just finished a poster of a quote my dad said to me as a kid all the time, “Can’t never could.” [Shown above]. Always stuck with me. I made the lettering using pieces of wood that had been inked and printed. 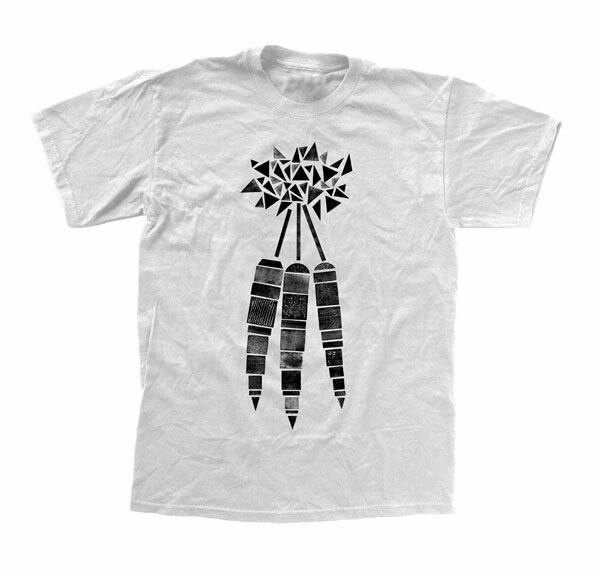 So I tried to do some illustrations of beets and carrots and making the letters JBG with those pieces. It felt right. It reminded me of plotted farm land, or crop circles, or quilts. It was very elementary to a degree, a back to basics, building block exercise for me. And then I realized that a farm is very much like that. Using what you have… the land, the equipment, your hands, hard work, different people from different backgrounds… and putting those pieces in action to produce something that changes seasonally. Much like the boxes of produce, you never get the same thing twice. There’s a system, but it’s a very organic one, pardon the pun. Beyond being cool, and I’ll get to that in a second, the new logo replaces the previous logo which was the result of a $300 design contest back in 2008, so right off the bat, the new identity is a winner. Tomato box in use, above, along with side and top views, below. 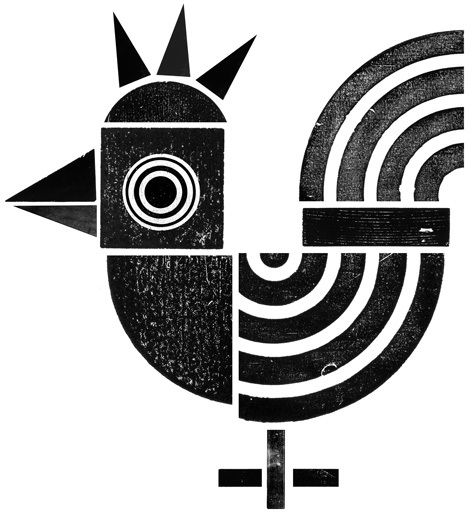 As mentioned in the opening quote, the new logo and identity revolve around inked pieces of wood that are then arranged quite organically to make up letters that then make words, or shapes like roosters and beets. For an organic farm, its seems like there couldn’t be a better fit than this identity. Granted, it could be applied to any organic farm in the world but, let’s face it: cool, weird, funky things like these tend to grow better in places like Austin. Some might remember this work from London-based Airside in January of 2009 — I have nothing else to add on that, just wanted to note it. What I like about the JBG work is that has an interesting balance between the woodsy and organic with something almost mechanical and early bitmap. Plus, those tomatoes look amazing. They need to be eaten, pronto. Ryan’s work for JBG first spotted via Public School. Before moving to a 20-acre lot in 2006, Johnson's Backyard Garden (JBG) was literally just a garden for, well, the Johnsons, Beth and Brenton in Austin, TX. 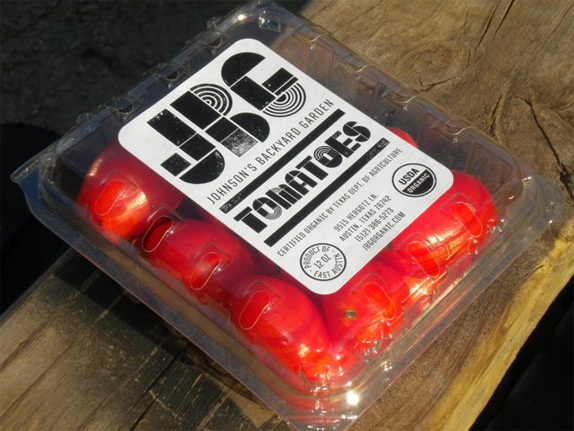 Today JBG is a 70-acre certified organic farm that functions through a Community Supported Agriculture (CSA) program, meaning that members buy a \"share\" in JBG's crop and in return they get delicious boxes every week of whatever the hard-working people have harvested. 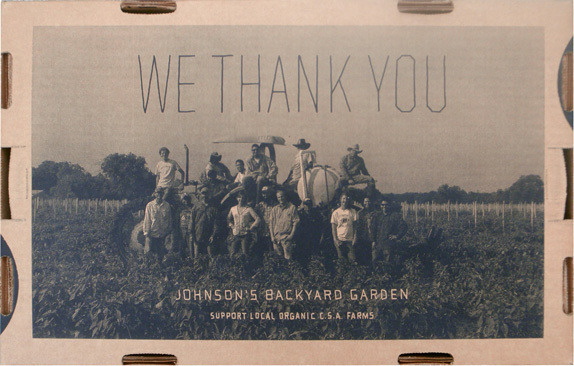 JBG counts with over 1,000 members making it the biggest CSA farm in Texas. 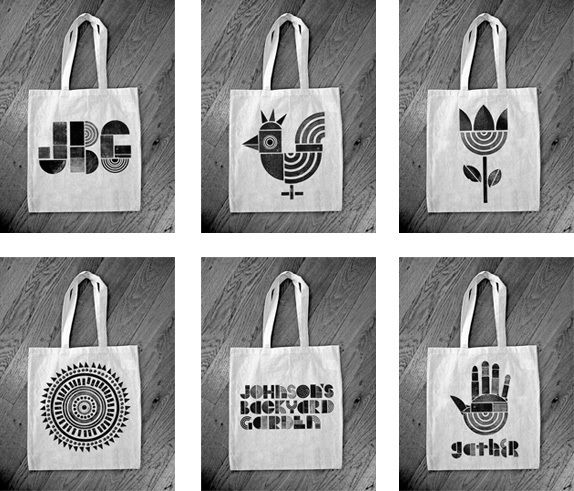 Earlier this year, JBG started using a new logo created by fellow Austinite Ryan Rhodes who happened to end up living in the Johnsons' old house.